Picasa Blog: Picasa -- it's not just for photos, anymore! Picasa -- it's not just for photos, anymore! Shooting video isn't limited to videocameras, anymore -- people are now capturing video content on everything from their mobile phones to their high-end SLRs. Thankfully, Picasa 3 can help you easily manage all that video footage, just like it does for your photos, so you can organize, edit, and share your favorite movies. Zoom the video size with slider, play your video in full screen or rotate a video -- just like you do with photos. Find a particular frame interesting? Go ahead and click the "Take Snapshot" button, and Picasa will capture the frame in its native size, saving it in a "Captured Videos" album for you. Want to trim your video? The "In" and "Out" buttons allow you to set start and end points for your clip, or you can simply drag the two triangle markers under a video. Don't worry about making a mistake -- just like with its photo editing features, Picasa provides full Undo and Redo. If you're happy with your edits, and want to save the polished results, just click "Export Clip". Picasa will save a new copy in your "Exported Videos" album. Did your digital camera generate a massive file for a short video? 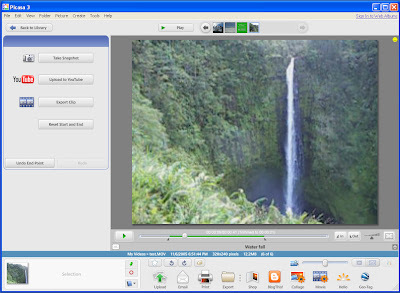 Many cameras don't do a great job compressing videos for easy sharing, but Picasa can help. When you click "Export Clip", Picasa will compress your movie into a smaller file, which saves disk space and makes uploading much faster. Use different transitions like Pan or Zoom to create cool effects when going from one slide to the next. Got MP3s? Add your own music soundtrack to your slideshows. Select your video quality: create a YouTube-friendly videos at 320x240, or render High-Definition videos at 720p or 1080p. Mix and match photo and video clips in your movies -- don't forget you can use the built-in webcam tool to create video, too. Movie Maker lets you easily add title slides and end credits, but you can also use the text and collage tools in Picasa to get creative, and make the perfect photo slide to introduce your movie. Like collages, you can always revisit a movie to make changes, add new pictures, or swap out the soundtrack. To do this, click the "Edit Movie" button at the top of the edit room when playing or viewing movie. Like photos, movies are more fun when you share -- so give the Movie Maker a spin, and start uploading your work!